The last thing I need is another Weblog, but there are several reasons for making this one. It will be a landing space for people who want to know about the various places that I write posts and articles ("Piltdown Superman" is my most active). The list of pages at the top are where I'm currently active, and I will be adding a few more, including my Christian testimony, maybe a "best of", as well as some others. This is www.cowboybobsorensen.com, and www.robertsorensen.net redirects here. 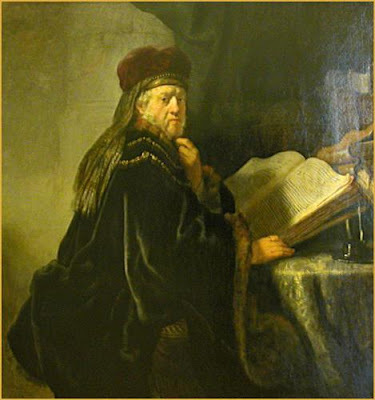 No, I don't think I look like Rembrandt's scholar. A rather lengthy testimony will be posted at a later date, but I'll tell you a little about myself. Some people put me on their enemies lists, since I am a Bible-believing Christian, biblical ("young earth") creationist, use Scripture and science to refute evolution, have a presuppositional apologetics streak (there is no "leave the Bible out of this and use neutral ground" in me), and politically Conservative. Lots of reasons for some people to hate me. I have a job (some people lied and said I make money doing my writing — not hardly! ), and my social media policy is far stricter than my employer's policy: nobody needs to know where I work. It's best for all that way. I founded "The Question Evolution Project", so you can consider that my employer. In addition, I founded "Question Evolution Day" (annually on February 12, Darwin's birthday), which was inspired by the "Question Evolution Campaign" of Creation Ministries International. Reckon I should tell you some terms. I've written thousands of posts and articles, and deleted quite a few on my oldest Weblog, "Stormbringer's Thunder", that were outdated, political, or just plain bad. The difference by my way of thinking is that a post is short, and often is an introduction to an article I want people to see. An article is something that I've put more effort into, and I usually put my name on it. This here thingie is a post. By the way, the "cowboy" moniker... Yeah, I lived out West: the west side of Michigan. No, someone commented and called me "Cowboy Bob". I thought about it, and realized that I'm a cowboy at heart; some real cowboys confirmed that. At my father's funeral, I heard some tributes being paid to him, and realized that he was a cowboy at heart as well. Anyway, this cowboy lived his first 40 years in Michigan, and now is in Kingston, New York. A note about my graphics. Sure do wish people would pay attention, just because an image is on the Web doesn't mean that anyone can do with it what they please. However, there are numerous "free to use" and public domain images that people can find without violating copyright laws. See "Images on the Web — An Appeal to Caution". One "iffy" area for me is the use of "meme" generators. Be careful with those. Their stock items are all over the place, and seem to be fair game, but anyone can upload an image and put a caption on it, so I recommend leaving those user-added images well alone. That's enough nattering on for now.